BAY POST INTERNET: Why Are So Many Elected Officials Backing The PSTA Sales Tax Increase? Why Are So Many Elected Officials Backing The PSTA Sales Tax Increase? 1. PSTA, TBARTA and their supporters have spent the last five years lobbying local City Councils, Mayors and County Commissioners that the plan now called Green Light Pinellas is the answer to the County's public transportation needs. 2. Most elected officials believe, and rightly so, that Public Transportation is a necessary service of local government, they just don't want their jurisdictions to directly pay for it in the form of higher property taxes. 3. As politicians, most of these elected officials feel this is not "their" tax increase, so come election time they will just blame the County or PSTA. endless lobbying of TBARTA and PSTA and the PSTA marketing effort. I can't begin to count the number of meetings I sat through when working for the City of St. Pete or attending public meetings where TBARTA was on the agenda. The presenters were always paid consultants with slick presentations designed to sell the concept of commuter rail. Same is true with City Council meetings around the County. Usually billed as "Public Transportation Briefings" or something like that. They were crafted to prepare the way for asking these local governing bodies to officially support the GreenLight plan. When it came time to put the sales tax increase on the ballot, PSTA, their consultants and marketing advisers simply went to the cities and asked for their support. Never having heard any opposition or taking time to actually look at the impact of the sales tax or the enabling Ordinance the City Councils and Boards quickly voted yes. Had this been a request for an increase in the property tax rate the outcome would have been different. Local elected officials would have been less inclined to defend a property tax increase. Most of the local City Council members and Mayors could care less if their County Commissioner gets beat up over a tax increase, that's his/her reelection problem. If the local politicians had felt they were going to be held responsible for $130 million dollar tax that will affect everything from tourism to retail sales, they probably would have given this referendum a bit more thought. Latest polling shows a growing number of people don't support the sales tax increase. 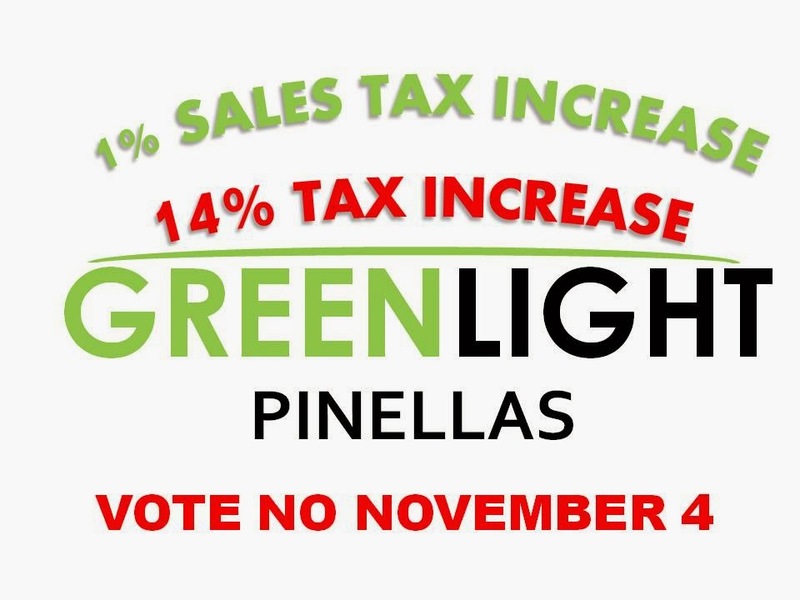 It's time to let your local City Council member or Mayor know you think they should take a second look at GreenLight Pinellas and the sales tax referendum. If the sales tax referendum passes, next election you'll probably remember that you're now paying more for almost everything thanks in some part to your current elected officials helping pass the largest Pinellas County Tax increase in recent memory.